Welcome back to Nursery we hope you all had a lovely summer ! This half term our topic is why do leaves turn crispy ? Maybe you could have a chat with your child about Harvest, leaves and why they change colour etc also talk about the seasons in general. 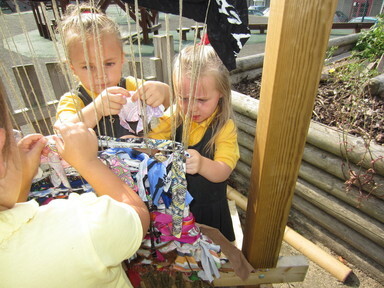 This week we have been taking advantage of the warm weather and we did some lovely weaving on our outdoor loom.